The Puig de Galatzo can be easily climbed from Estellencs on a nice loop walk through varied landscape. 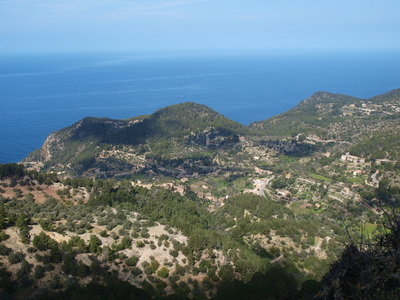 For those without private transport, Estellencs is actually the easier starting point for incursions in the massif, with bus route 200 linking Estellencs to Palma. All the trails on the loop are well defined and sign posted, and this is a great day walk suitable for all. 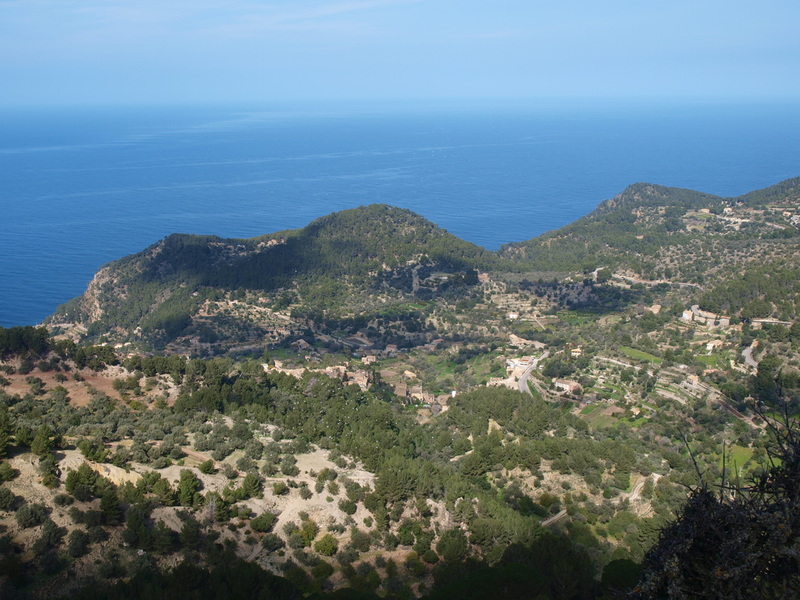 Those heading from Estellencs towards Banyalbufar or Esporles can opt to take one of the 'high' routes from the Col d'Estellencs, a major junction between the Galatzo massif and the Serra de Puntals culminated by the Mola de Planicia. Not that the trails to the Col and northwards of it are not signposted (but usually cairned or well defined) and navigation can be a bit trickier. 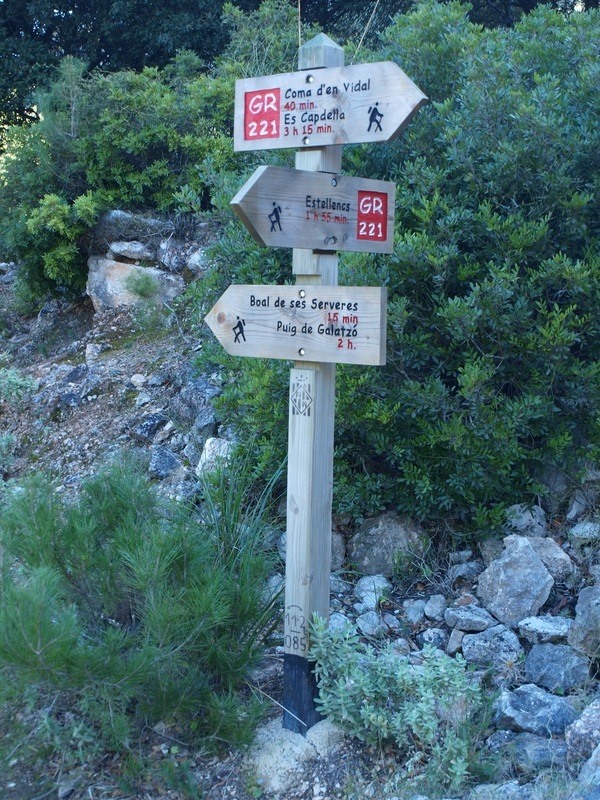 The tracks from the Col d'Estellencs to Puigpunyent (via Sa Campaneta or on the more direct route south) are clearly marked. Park the car or walk from Estellencs to point A on the map where the trails starts, and head up the wide and well signposted track winding its way up the hill. Ignore the turn off on the right towards Esclop; at the next junction, you can choose between doing the loop clockwise of anticlockwise. The northern track is slightly easier and is shaded, but offers little in way of views. 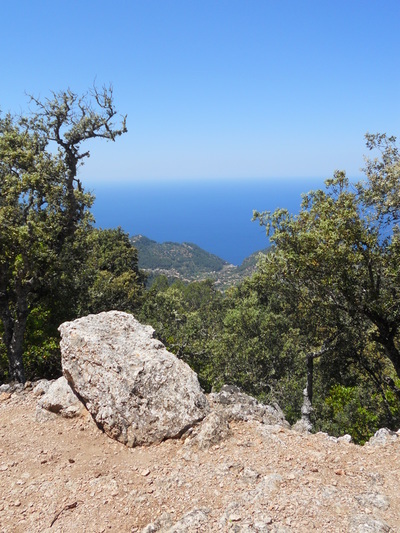 If the weather is not too hot, an anticlockwise walk is probably best, so take a right at the junction and wind your way up the pas des Cossis. The scenery opens up and becomes more barren once over the pas; follow the trail down and up around a gully and up to a a small col, on rocky terrain all the way to the next junction, at Pas de Sabatera where you take a right (straight ahead leads you back down to your starting point through the forest below). You are now climbing steeply towards the summit; one more turn off to the right (straight ahead goes to Font de Pi) and you are half an hour from the top of Galatzo, climbing steeply on very rocky ground. 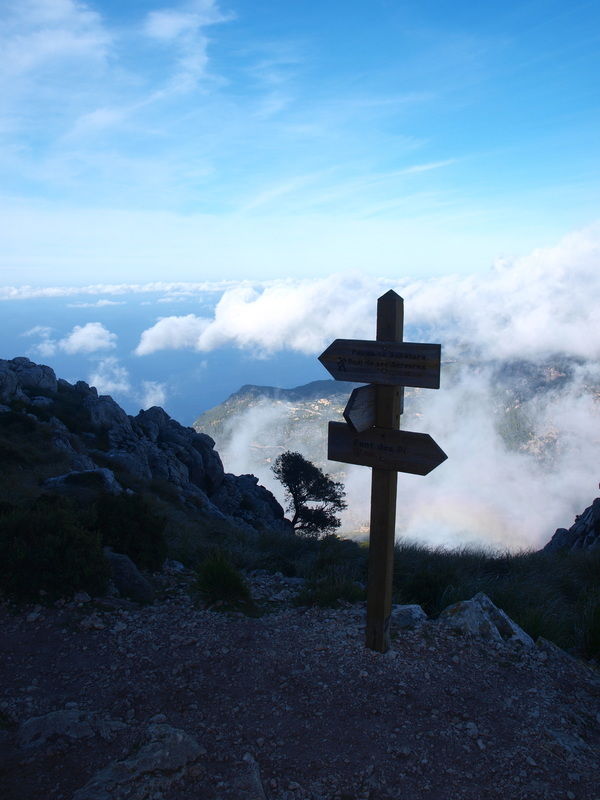 After a couple of small scrambles, you will join the other hikers at the summit and enjoy the great views over west Mallorca and Estellencs, a long way down. Return the way you came, down the Pas de na Sabatera and take a right on the path heading through the forest. 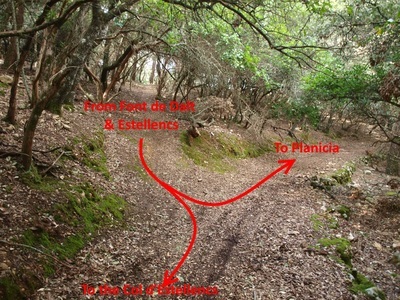 You will soon reach a minor turn off to Font de Dalt; follow the main trail to the left and you will eventually reach the Son Fortuny picnic area (not to be confused with Finca Son Fortuny which is a private agricultural exploitation a few kilometers to the east). Push on ahead and take a right downhill to return to the main road. Start off as described in the Puig de Galatzo route here above. At the second junction, take a left onto the clockwise circuit, unless you want to climb first to the summit of Galatzo, in which case the right hand (ahead) way should be preferred. Those wishing to climb to the top of Galatzo and push on on the high route all the way to Esporles or Banyalbufar will have a great but very, very long day, on fairly difficult terrain, so start early. On the clockwise route, you will be walking through the forest for about an hour from the junction on a wide track till you reach a sign pointing off the main track to the Font de Dalt. Take the faint track towards the font, pass some ruined walls and huts, and look attentively for a trail continuing ahead at a more or less level gradient eastwards (blue trail on the map). The trail is quite distinct and relatively popular with off road cyclists. 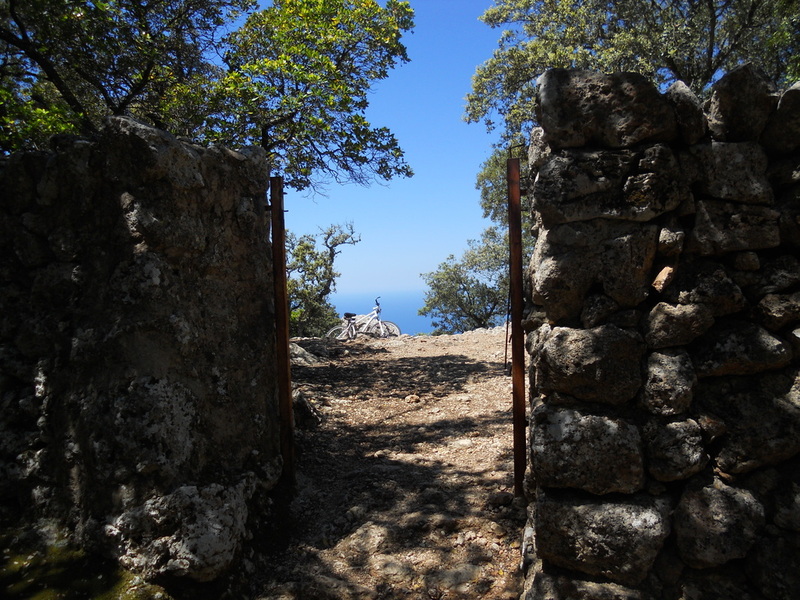 Follow this for an other 30 to 45 minutes, deep in the forest all the way; you eventually will come to a junction with a much larger track, where you take a left to the Col d'Estellencs 3 minutes away, with its distinctive boundary wall and stile. Note that the direct route From Estellencs to the Col d'Estellencs via Finca de Son Fortuny goes through private grounds, may not be passable and is dificult to navigate on the upper slope of the forest (I tried once to go down this way and was greeted at the Finca by some rather unfriendly guard dogs); ask in Estellencs what the deal is before setting off this way. Go over the style or through the gate and look on the flat ground of the col a short distance away for a cairn indicating a faint trail on the left leading up to the Serra des Puntals (red on the map). This trail is quite faint but well cairned, and involves negociating a rather steep scramble (pas de sa Rata) up a gully just before the Puntal de Planicia (also called Puntal de Son Fortesa) reached on short one way track on the right. 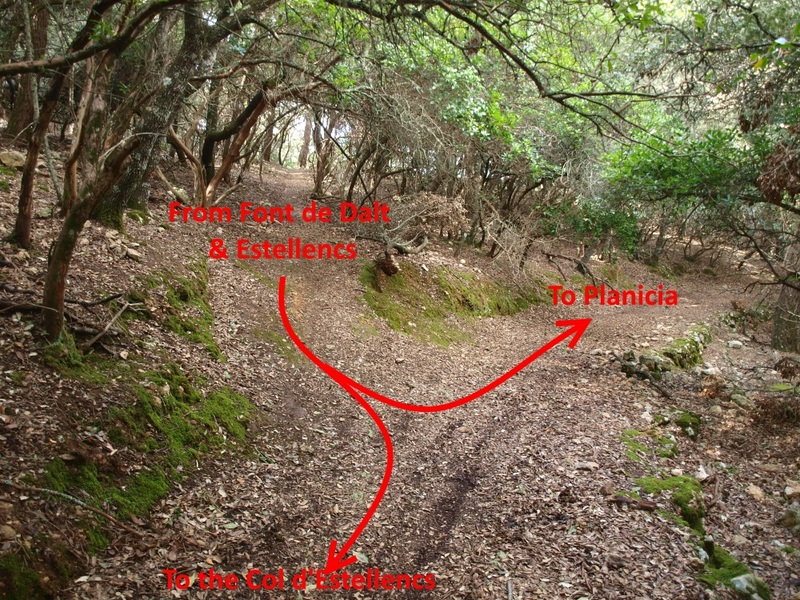 You will eventually ( 1 1/2 to 2 hrs) arrive on the beautifully built ancient trail of the Mola de Planicia, from where you can descend either towards Esporles by taking a right (either via son Vic -easyish- or on the Cami de ses Rotasses - very faint, very difficult-) or towards Banyalbufar by taking a left, reached in just under two hours. You can also climb to the top of the Mola de Planicia, and enjoy the view from up there if you have the time and energy to do so. 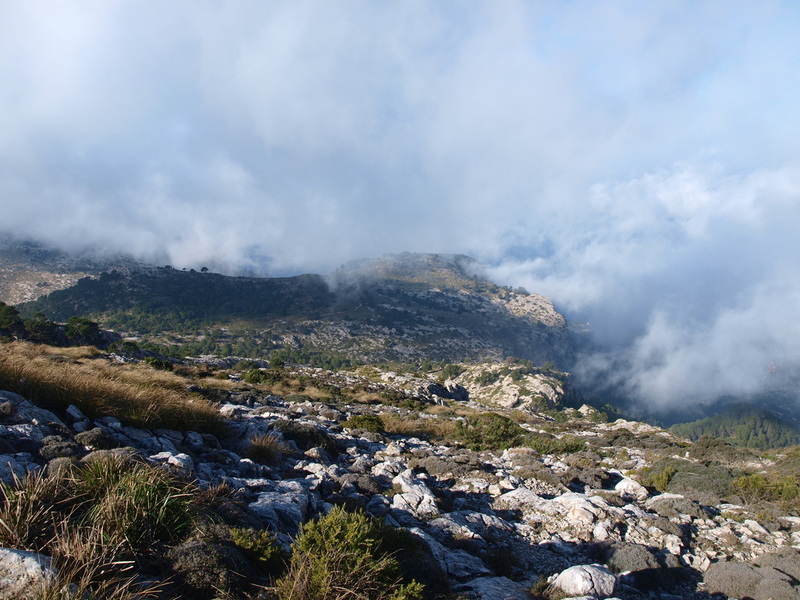 See the Mola de Planicia section for more details on theses routes. Do not go over the style, but back down the largish track on the north west side of the boundary wall you just came up on. 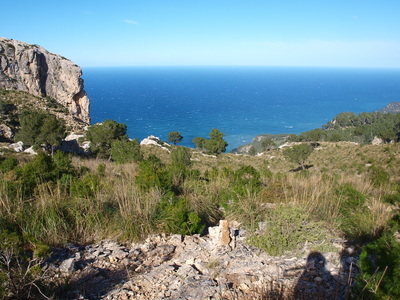 A few hairpin bends further a trail, unmarked but favoured by cyclists (look for the tire marks) heads off the main track in a northerly direction, taking you an large swoop bellow the Serra des Puntals. lookout for a great viewpoint in the forest overlooking Galatzo and Esclop, then head back in the dense woods; pass a boundary wall, reach and ancient charcoal maker settlement and head on along the many forestry tracks in the direction of Planicia, that you should reach in about 1 1/2 hrs from the col. Banyalbufar is a further 2 hrs away from Planicia. See the Mola de Planicia page for more details on this route.